A pumpkin patch inspires us to create fall tablescapes to delight friends and family. Decorating a table in your home is a warm way to greet guests or delight family members as we begin to spend more time indoors. So as we move inside for the fall and winter months, we’ve compiled some of our favorite ways to bring our favorite fall decorating ideas to the table in fresh and creative ways that highlight the best of what autumn has to offer. Fall is a great time for playing and experimenting with texture. Crunchy, dry leaves paired with smooth, round gourds are a way to juxtapose contrasting textures and create a pleasant look that catches the eye. Foraged vines and branches are one way to work with texture in a table centerpiece or bouquet. They are also an interesting play on the popularity of loose and wild arrangements that have dominated weddings in the past year. Run these long branches around and through larger arrangements to create movement and height to your tablescape. Add another textural element with seasonal fabrics like burlap or twine. A few yards of burlap is an affordable way to add texture to a table. Simply lay over a table linen as a runner then scatter or pile fallen leaves on top. Little details like using twine to tie around a bouquet or vase is also a simple and effective way to create a fall aesthetic. The gourds, squashes, and pumpkins that fall provides us can become creative vessels for flowers as well as giving us the chance to incorporate our favorite fall finds with luxury flowers in warm shades of golds, oranges, and reds. Many bouquets and arrangements this time of year feature stunning edible accents like pomegranate, berries, and pumpkins. A charmingly traditional option would be our Pumpkin Sunflowers. Bright and happy sunflowers arrive in a perky pumpkin patch vase like a welcoming, bright sign of autumn. Add this bouquet to a table of any size with mini or carved pumpkins and a little burlap for a rustic look reminiscent of a fall day on a farm. 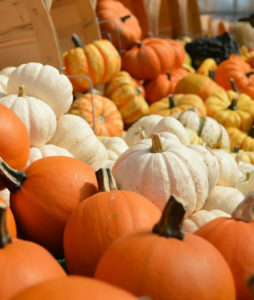 We also have beautiful bouquets that would pair wonderfully with white pumpkins and blue squashes of varying sizes for a more monochromatic display. For example, the Atlantis Pearl Bouquet which has silvery Dusty Miller accents with white luxury roses and hydrangeas. This muted palette plays on the popularity of light, airy blues and whites of heirloom pumpkin varieties as well as keeping design subtle yet eye-catching. For a simpler choice, the a Rose Bowl Centerpiece adds elegance with little work. 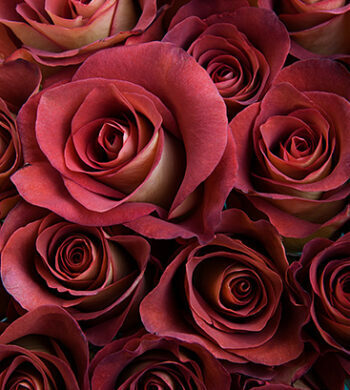 These centerpieces feature our luxury roses in a variety of colors. They arrive in a white ceramic bowl perfect for displaying anything from seasonal fruit like pomegranates, apples, or pears or little pinecones or acorns. 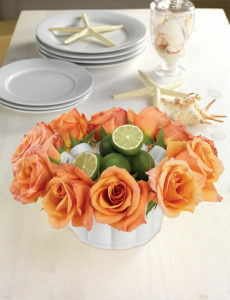 Our Orange Rose Bowl is versatile and elegant for you to add fall fruit for a festive centerpiece. Another one of our favorite fall table ideas is using different colors to create dimensions and depth in your decor. While fall is known for its darker and moodier palette, adding flashes of bright color to keep things feeling fresh on your table. This is a nice way to add color to a muted tablescape. Keep your tablescape in the same colors then tie colorful ribbons to chairs to pull together one, cohesive fall look. If you are still interested in the blush tones that have been so popular this year, a great way to move into fall season with these pinks is to pair them with richer colors of berry or mustardy yellows that can be seen in flowers such as Leonidas roses. This is a great way to bring together arrangements or centerpieces on longer tables or larger tablescapes with many different color palettes. And somewhat surprisingly, tropicals can lend an exotic air while keeping in line with Fall’s yellows and oranges. Our Aloha Orchid & Bromeliad Garden is a great option for those wanting to take a more tropical route. With all these fun and festive ways to dress your table, kicking off the fall season has never been easier. Just remember if you try one of these ideas, be sure to share with us on Instagram by tagging your photos #calyxflowers so we can all join in the fall fun.